Land Cruiser is one of the most respected nameplates in the automotive world and this is directly attributable to its rich history and for consistently setting the standard in off-roading. 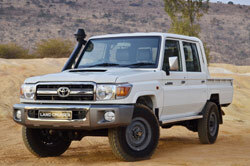 In South Africa Land Cruiser made its debut with the FJ-45 pick-up in 1971 and hasn’t looked back since. The Land Cruiser brand now encompasses no less than four model ranges each with their own distinct flavour. The new 4.5 litre V8 turbodiesel engine is the first Toyota engine with a graphite-iron cylinder block. The use of graphite iron provides for low weight and a compact size while resisting the high cylinder pressures of a turbocharged diesel design. The turbocharged and intercooled Quad Cam 32 valve Toyota 1VD-FTV engine uses high-pressure (common rail) D-4D direct injection. The water-cooled turbocharger utilises a variable nozzle vane to ensure high engine output, low fuel consumption and low emissions. The 1VD-FTV engine has an air-to-air intercooler and dual electronic throttle valves. The 4461cc engine has a 90 degree V angle, undersquare bore and stroke dimensions of 86mm by 96mm to maximise torque and a compression ratio of 16.8:1. The bank offset is 22mm and the bore pitch is 97mm, to create a compact block relative to the engine’s displacement. The forged steel crankshaft has seven balance weights. All pins and induction fillets are hardened to ensure optimum strength. The base of the cylinder block has substantial stiffening plates, to minimise vibration, and four tightening bolts for each bearing cap. The connecting rods are made of high-strength steel and the big-end bearings are secured with nut-less tightening bolts. The 1VD-FTV engine has aluminium-alloy pistons with combustion chambers in the piston crown. Oil jets at the bottom of the cylinder bores spray oil on the underside of the pistons to improve piston cooling and lubrication. The cylinder heads are made of aluminium alloy, with two-stage water-jacket construction to improve cooling. An exhaust gas recirculation (EGR) passage reduces emissions. The combustion chamber design includes four valves with a central solenoid-type high-pressure injector nozzle to improve performance and minimise emissions. The injection system includes pilot injection control to improve performance and fuel economy and reduce emissions. A glow plug located between the inlet valves improves engine starting. Four camshafts are used in the new Land Cruiser V8 diesel engine, to ensure accurate valve timing. The new engine has maintenance-free valve clearance adjusters to maintain constant zero valve clearance between the rocker arm and valve stem. The 1VD-FTV engine’s turbocharger is water-cooled, for increased reliability. The inlet air passes through an air-cooled intercooler and separate throttle valves for each cylinder bank, before reaching the inlet ports. A crossover pipe balances the exhaust pressure between the two cylinder banks, to ensure efficient turbocharger operation. Other features of the 1VD-FTV engine include a linear temperature-controlled coupling for the cooling fan, a fuel cooler, a fuel filter with a warning switch, a segment-conductor-type alternator and an oxidation catalytic converter.